“Where there is no vision, the people perish.” – Proverbs 29:18. Andrew Carnegie hired Napoleon Hill to interview 500 millionaires for a book “Think and Grow Rich”. The first edition was released in March, 1937. While the title implies that this book deals with how to get rich, the author explains that the philosophy behind the book can be used to succeed in all areas of work and can help one to become or do almost anything they want. It took him over 20 years to complete the book, interviewing famous people such as: Thomas Edison, Theodore Roosevelt and Charles Schwab. Napoleon found out that these millionaires all had one thing in common: Clearly defined, written goals that were kept before their eyes. A professor at VA Tech did a study. Asking random people on the street if they had dreams & goals? 80% responded they did not have any. 16% responded they had dreams but hadn’t written them down. 3% responded they had written them down at one point, but didn’t know where they were now. 1% responded they had dreams, wrote them down and kept them before their eyes. EVERY one who responded in the 1% category – was a millionaire. In earlier years, I often wrote down my goals and dreams, but like the 3% above, would get distracted with just living life; Going through the motions with all the “busyness” that accompanies the mom of two very active boys while working over 40 hours a week. I did good things with my time; I served as the Vice President of the PTO and on the Athletic board at the school. Attended all my son’s sporting events, hosting the teams for spaghetti dinners, involved in community charity events, yet I was still just going through the motions letting life guide me, instead of me guiding my life, instead of stopping to think “What does God want for me?” “What’s my Purpose?” I heard the late Pastor Myles Munroe say “Just because it’s good, doesn’t mean it’s right.” That resonated with me. I have carried one dream in my heart for 20 years – to write a book. As a teenager I envisioned myself speaking to large crowds, having a ministry, owning my own business and opening a shelter for those in need. I would often write “speeches” and draw out “plans” for a shelter. I had big dreams! 3 years ago I started a new chapter in my life. For the first time in 27 years of being a wife and mother, I found myself with grown adult boys and living alone in a new city, very different from the small, rural town I grew up in. I was an hour away from all of my family and friends. I started a new job the Monday after I moved, and to be quite honest, for a bit I was a little “lost” in my new environment. I have always been a writer and, well, Um…maybe a bit of an organizational freak. I like to organize my thoughts on paper. Turns out, that helped. I wrote down a list of “categories – Physical, spiritual and Relationships” asking myself “What do I have to do to become healthy and whole?” Take care of myself physically with a goal of exercise and healthier eating habits. Find and build my faith once again. Remove negativity from my life. Set boundaries. I kept that list in front of me and it was amazing the transformation that took place over the next year. I busted out of my cocoon a butterfly! A couple of years on this side of healed and whole, a new friend gave me a CD by Teri Savelle Foy entitled: “3 Bones of Success”. (posted in my links) That was in June of 2014. I fell in love with her message and energy. 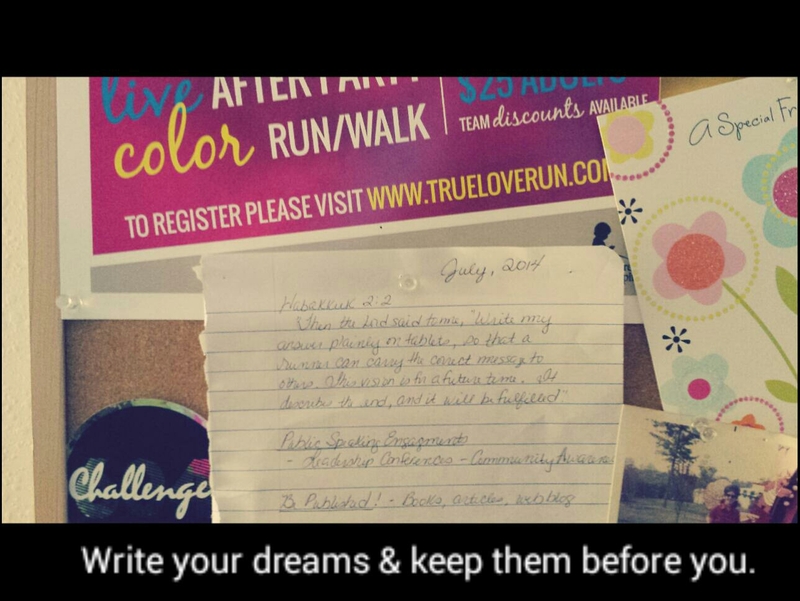 I was inspired to create my “Vision Board” and “Dream List”. As Teri said “I don’t know how this is going to happen God, it’s just my job to dream!” Some dreams on my vision board? To be published; book, blog, articles. To own my own business – I’ve got my eye on a big old house I’d like to turn into an “Event” location. Start a ministry. Be able to pay for the guy in front of me at the grocery when he doesn’t have enough. (I was in the grocery back in June and the guy in front of me didn’t have enough to pay for his food. He sadly had to walk away and leave them sitting there. I barely had enough for mine that day. I prayed “God, bless me not so I can acquire more – so I can give more.”) I came home and wrote that on my vision board. That was July – just 5 short months ago. I wrote that vision in my journal; I hung it over my computer in my home office where I would see it every day. And since July I am proud and humbled to say; due to divine steps and appointments and I am the head of a clothing ministry through our church. I will soon be publishing my first book and am so excited at the way it has all fallen together. I am published – you are reading my first blog page! And I have bought groceries & gas for someone in need, paid for an electric bill to provide a family heat, hotel rooms for the homeless, anonymous donation to a stranger who was laid on my heart. 4 months ago I barely had enough to buy my own groceries. How did that happen?? I wrote the dreams in my heart and God made the way! I encourage you to think about what you want, write the dreams in your heart and keep them in front of you. I may never be a millionaire, but I have received blessings in my life that have no price tag. Live life with Purpose! As we approach another year, are you ready? Don’t just stumble into the New Year hoping things change. God will be there with you, but you have to do your part. You have to live with a vision and a purpose. I wrote this blog back in 2015 – before the release of the book, before speaking engagements, before the purchase of my home, etc.. I did the dreaming, praying and believing. God was faithful. Not all items I wrote down came to fruition that next year, many did but some took a year or two (God’s timing). I encourage you, dare to dream today – write down what you want the Lord to help you achieve in 2018! If it’s in alignment with His will and His word? He says he will give us the desires of our hearts.